Part of the investigation into the starting problems has been the floats in the carbs. As these can become gummed-up it was a possibility that this is where the fuel starvation symptoms were originating, but it would also give us access to the jets. The HIF carbs (horizontal in-line float) have the float sitting underneath the needle and jet. This may be better for emissions, but is a nightmare to access as you have to take the whole assembly off the car. Getting the carbs off looks a bit daunting, and I certainly wasn't looking forward to it, but it is more fiddly than difficult. The best starting point is to remove the dashpots along with the pistons and needles, being careful as you extract them not to allow the pistons to fall out from underneath the dashpot. Removing these first allows you unrestricted access to the top two bolts holding the assembly on the engine and I'd say is pretty necessary. Before undoing the bolts you'll need to disconnect the overflow pipes and fuel line, undo the clutch and throttle cables and unhitch their return springs. I actually left the throttle cable attached as removing it involves a circlip which I hate dealing with. 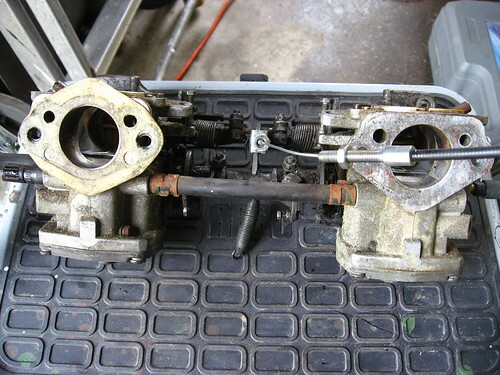 There are four bolts (fig 3) holding the carbs on the engine, one next to each dashpot and another two behind the linkages. These two are tough to access and the two high ones may require you to unscrew them slightly then pull the carbs forward before they can be fully unscrewed. Each bolt has two washers, so be careful not to drop them. Once the carbs are off the car you'll need to invert them to access the float chamber (fig 4). Have something on the area you're working to catch the fuel which will likely pour out as you turn them upside-down. You've then got four screws (fig 5) between you and each chamber; be careful as you remove the cover so as not to tear the rubber seal. As it turned out the float chambers seemed to be really clean (probably the cleanest part of the whole engine bay! ), so I contented my self with giving the lower jet entrance in each float chamber a blast with a can of compressed air to make sure it was clear of any particles. I also gave the outside of the carbs a good spray with a can of carb cleaner while I had access to all angles.